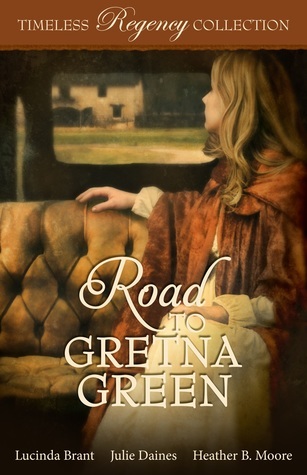 From the publisher of the USA TODAY bestselling & #1 Amazon bestselling Timeless Romance Anthology series in Regency Romance, comes ROAD TO GRETNA GREEN. Featuring New York Times bestselling author Lucinda Brant, Julie Daines and Heather B. Moore. When widow Helen, Lady Dysart, returns to the English border town of Carlisle for a family wedding, she decides to confront local physician Royston Meredith, the man who broke her heart. Royston has loved Helen since they were teenagers. He thought the feeling mutual until she up and married the local MP. While everyone around them hopes this reunion will see Helen and Royston sort out their differences, of more immediate concern is Royston’s youngest sister Grace, when she elopes with the steward’s son. Helen and Royston dash after her, determined to save her from scandal and an imprudent match. But in saving Grace the couple may very well be saving themselves. Richard Arden needs a wife in order to collect his inheritance. Eliza Barnes needs to escape an arranged marriage to the odious Mr. Barrington. When Richard overhears Eliza’s plight at the coaching inn, he does the most reckless thing he’s ever done—he proposes to a woman he’s never met before. What begins as an easy solution leads Richard and Eliza on a journey across the country with Mr. Barrington at their heels, complicated even more when their fake engagement leads to feelings that are very real. Unfortunately, Bridget’s marriage is over in four hours due to her husband’s tragic death. Fortunately, Bridget is now free from her distasteful marriage of convenience. When her year of mourning passes, and she meets her former husband’s cousin, Bridget discovers that her difficulties are far from over. Lord Hugh Wilde blames Bridget for his cousin’s death. But when Bridget’s sister elopes to Gretna Green with a man of questionable reputation, Lord Wilde is the only one who can help, and they both have to set aside their pride to rescue the errant sister. Another lovely Regency collection from Timeless Romance Anthologies! There is plenty of drama as carriages race across England to Scotland, some couples seeking elopement while others are seeking to prevent it! There's something about traveling together that brings these couples closer together and provides opportunities for deeper feelings to develop. I especially enjoyed Richard and Eliza in Fools Rush In with their fabricated stories and the joy they find in each other's company. Their journey was entertaining and they were both easy to like. A Lady of Scandal was my other favorite story because of the relationship dynamics of the Reeve and Wilde families. Bridget and Hugh are both misinformed about each other's character, so it was interesting to see how their true natures are revealed, recognized, and hearts are softened. Perfect for fans of sweet Regency romance!